“As for the coming of the scion of David, I need to posit the following premise: Moses the first redeemer of Israel, reached the age of eighty years and did not know or sense that he would redeem Israel. Even when the Holy One, blessed be He, said to him, ‘Come and I will send you to Pharao…’ (Exodus 3:10), he declined and did not want to accept that mission. So it will be with the final redeemer. “The very day that the Bet Hamikdash was destroyed, was born one who, by virtue of his righteousness, is fit to be the redeemer.12 At the proper time G‑d will reveal Himself to him and send him, and then will dwell upon him the spirit of Mashiach which is hidden and concealed above until his coming. Sanhedrin 98b; Pesikta Rabaty 34:6 (ed. Friedmann, ch. 33). See also Bereishit Rabba 2:4; and cf. R. Bachaya on Genesis 1:2; and Netzach Yisrael , ch. 43. Pesachim 54a; Pirkei deR. Eliezer ch. 3 (see there Bi’ur Haradal note 14); Bereishit Rabba 1:4 (and see there Minchat Yehudah). Cf. Yeshu’ot Meshicho, Iyun Hasheni:ch. 3. Or Hachamah on Zohar II:7b; R. Chaim Vital, Arba Me’ot Shekel Kessef, ed. Tel Aviv 5724, p. 241a-b. See also Yeshu’ot Meshicho, Iyun Hashelishi:ch. 3ff. See Isaiah 11:1; Jeremiah 23:5-6 and 33:14ff. See also II-Samuel 7:12-16, and Psalms 89. In this context, Mashiach is often referred to as (and identified with) David see Hosea 3:5; Jeremiah 30:9; Ezekiel 34:23-24 and 37:24-25 (cf. below. note 51). Tanchuma, Toldot:14, and in ed. Buber, par. 20 (and see there note 139); Agadat Bereishit ch. 44. (See Emek Hamelech, Hakdamah, ch. 12, p. 14d, and Sha’ar Kiryat Arba, ch. 112, p. 108d). Rambam, Principles, Article 12, and Igeret Teyman, ch. 3. (Cf. also his Sefer Hamitzvot II:262). Cf. Zohar I:110b and III:188a, and commentaries there. Sources in notes 4 and 5. A superficial glance at Zohar II:7b would seem to suggest this; but see the commentaries cited in note 45. R. Ovadiah of Bartenura, Commentary on Ruth (appended to Mikra’ot Gedolot-Bamidbar, p. 479), see there. Ibid. Cf. Igeret Teyman, ch. 4: “With respect to his arising, he will not be known beforehand until it is declared to him… a man, unknown prior to his manifestation, shall rise, and the signs and wonders that will come about through him will be the proof for the authenticity of his claim and pedigree…”Note that this concept of the ‘bestowal and infusion’ of Mashiach’s soul unto a living tzadik (related to the Kabbalistic concepts of gilgul and ibbur reincarnation and ‘impregnation’) explains the identification of Mashiach with King David himself (see Yeshu’ot Meshicho, Iyun Harishon, ch. 5:hakdamah 6; and see also R. Ya’akov Emden’s commentary on the hymns of Hoshana Rabba, end, s.v. hu David atzmo). Likewise, it explains the identification of Mashiach with Moses, when he is called “the first redeemer and the last redeemer” (see Shemot Rabba 2:4, and Devarim Rabba 9:9); and as noted in Zohar I:25b and 253a that the numerical equivalent of Mosheh is the same as that of Shiloh (the term in Genesis 49:10 denoting Mashiach): the soul of Mashiach is the “soul-of-the-soul” of Moses, so that in effect Moses will be the final redeemer (and there is no problem with the seeming discrepancy of Mashiach being a descendant of David of the tribe of Judah while Moses is a descendent of the tribe of Levi). 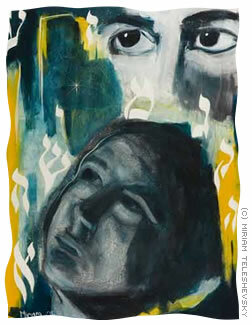 See R. Chaim Vital’s Likutei Torah, and Sha’ar Hapesukim, on Genesis 49:10. Note also Or Hachayim on Genesis 49:11! Responsa Chatam Sofer VI:98. See also Chatam Sofer al Hatorah, ed. Stern, vol. II: p. 18a, on Exodus 4:26, and note 9 there. See Agadat Bereishit ch. 67 (68). See also Yerushalmi, Berachot 2:4, and Eichah Rabba 1:51. See also Sdei Chemed, Pe’at Hasadeh: Kelalim, s.v. aleph:sect. 70. See Likkutei Diburim , vol. II, p. 628ff. Tanchuma, and Agadat Bereishit, cited above, note 47. Cf. Yeshu’ot Meshicho, Iyun Hashlishi:ch. 1. See also Or Hatorah-Na”ch , vol. I, p. 265f. Rambam, Introduction to Sanhedrin X; Principles, Article 12 (in popular versions, though not in ed. Kapach); and Igeret Teyman, ch. 4. Hilchot Teshuvah 9:2; Igeret Teyman, ch. 4. See Igeret Teyman, ch. 4. Pesikta Rabaty 37:1 (ed. Friedmann, ch. 36). See Midrash Tehilim 2:9 and 110:4. Hilchot Teshuvah 9:2; Hilchot Melachim 11:4. Note also Yalkut Shimoni, Pinchas:par. 776, that Mashiach will have the unique gift of understanding and persuading each individual despite the wide diversity in people’s minds and attitudes. Eliyahu Zutta ch. 20; Oti’ot deR. Akiva, s.v. zayin. See Rashi (and other commentaries) on Song 1:2. Cf. Zohar III:23a; and Vayikra Rabba 13:3. See also Tanchuma , ed. Buber, Chukat:24, and Pesikta deR. Kahana , ed. Buber, ch. IV (p. 39af. ), and the editor’s notes there. Kohelet Rabba 11:12. For a comprehensive analysis of the concept of the new manifestations of Torah in the Messianic era, discussing the various Halachic and philosophical issues involved, see R. Menachem M. Schneerson shalita, Kuntres Be’inyan “Torah Chadashah Me’iti Tetze”. Cf. also the commentaries on Zohar III:23a; and R. Abraham Azulay, Chessed Le’Avraham, Mayan II: 11 and 27, and ibid. Mayan V:36. Midrash Tehilim 2:3 and 87:6-7. Bereishit Rabba 98:9 (see there Minchat Yehudah); Midrash Tehilim 21:1. Cf. above II-E.
See Midrash Pirkei Mashiach; and end of Perek R. Yoshiyahu. Note Or Hachayim on Exodus 21:11; and cf. above, note 23.